DS DEXTERITY INTERNATIONAL PTY LTD presents the 1st Annual ADARA Awards 2018!! 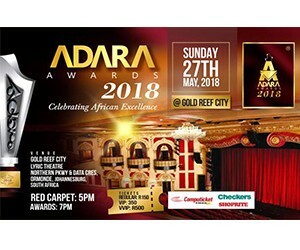 Adara Awards 2018 will be taking place at The Gold Reef City Lyric Theatre on Sunday 27th May 2018 in Johannesburg – South Africa. Featured artists will be Kunle Ayo, Brian Temba, Joe Makhanza, Femi Koya and many more. ADARA Awards is capturing the excellent work all Africans are doing and to bring to the attention of the world this work, by publicizing and recognizing it. The work is to act as a catalyst to build the integration of Africans and to destroy stereotypes about Africans to the rest of the world. The recognition is aiming to compel them to do more in their host country and become proud ambassadors of what they do and what Africans can achieve together. Entrepreneurs and entertainers will gather under one roof to Celebrate African Excellence! Tickets sold at Computickets, Shoprite, Checkers and House & Home. Prices range from R150, VIP @ R350 and VVIP @ R500. Red carpet starts at 5PM and the Award Ceremony starts at 7PM. Call: 011 326 1161 / 062 808 3549 and email admin@adaraawards.comor visit www.adaraawards.com ADARA Awards in partnership with Africans in Diaspora Forum and endorsed by African Ambassadors from Nigeria, Angola, Zambia, Cameroon, Ghana, Zimbabwe, Tanzania, Rwanda, Kenya, Botswana, Uganda, Lesotho,Namibia, and Swaziland.